The UAE pavilion, managed by the Department of Culture and Tourism - Abu Dhabi, has concluded its activities at the 32nd Al Janadriyah Festival in Saudi Arabia, along with the participation of 145 governmental and private institutions, after receiving 1,888,200 visitors. Around 80 per cent of the 6,500 square-metre pavilion was made of mud and natural elements and included an eight-metre-high 'Barjeel' wind tower as part of its design to showcase the UAE's authentic traditional architecture and its close connection with the local environment, and highlighting the country's commitment to sustainability, heritage and traditional arts. Covering a variety of topics, the UAE pavilion incorporated 45 specially-designed events, ranging from cultural and promotional to interactive, as well as 25 diverse activities and 425 other activities. These activities presented the rich cultural heritage of Abu Dhabi, featuring traditional Emirati practices that are part of Unesco's list of Intangible Cultural Heritage of Humanity. The UAE pavilion presented the country's history by detailing various aspects of Emirati life through traditional performances that emphasized the integration between the UAE's past and future and the aspirations of its people. Featured performances included displays of traditional handicrafts, Al Razfa and Al Yola dance performances, and Emirati folk songs. A 'Marine Environment' section also included live performances of seafarers, with demonstrations of making traditional fishing nets and 'Karakeer', or fishing cages, the boat making craft known as 'Al Jilafa', salting fish, pearl oyster shucking, in addition to seafarer songs. The festival also incorporated the 'Bedouin Environment' section, which featured live displays of falconry, Al Shilla and Al Taghrooda art performances, as well as Al 'Azi and Al Tariq performances. Saif Saeed Ghobash, Director-General of DCT Abu Dhabi, said, "Our participation in Al Janadriyah Festival is a unique exemplar of our achievements in the fields of heritage and culture helping to distinguish the Emirate of Abu Dhabi." 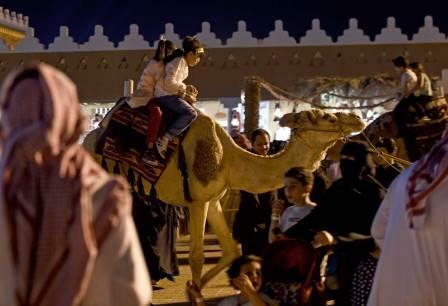 Al Janadriyah Festival is the heritage and culture festival held near Saudi capital Riyadh. 145 governmental and private institutions participated in the UAE pavilion. Nearly two million visitors visited the UAE pavilion. Around 80% of the UAE pavilion was made of mud and natural elements. Barjeel' wind tower was part of the UAE pavilion to showcase UAE's traditional architecture.